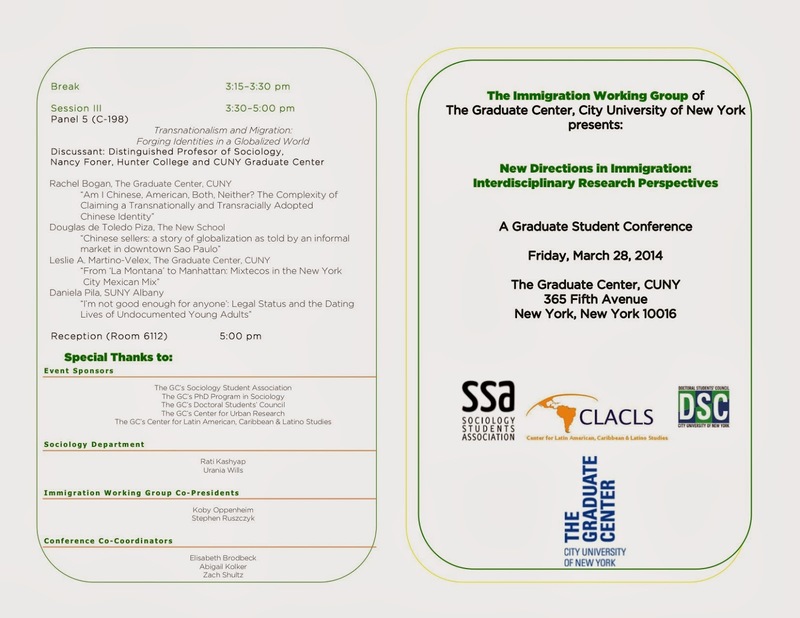 In addition, CUNY's Law School offers clinics to assist immigrants and non-citizens. Also take a look at CUNY CLEAR (Creating Law Enforcement Accountability & Responsibility) project which offers help with legal representation and consultation. A very interesting data tool from MPI. This is both a report and link to a data tool from MPI. Among the questions we have fielded at the Migration Policy Institute's National Center on Immigrant Integration since DACA's launch in 2012: "What can you tell me about the languages spoken by DACA youth in Los Angeles?" "How many children in Houston's middle and high schools might qualify for deferred action?" "What is the number of eligible Asians in Queens?" The answer to these questions, until now, was "not much." We published national estimates of the population that could potentially qualify for DACA at the program's launch, and again at its first and second anniversaries, but did not have more granular data available at the local level. Using an innovative methodology that imputes unauthorized status to the foreign-born population using U.S. Census Bureau surveys, we have created a new web tool that offers estimates of the size of the DACA population in 41 states and 111 counties. And beyond that, we have developed in-depth profiles of the DACA-eligible in the 25 states and 36 counties with the largest such populations. 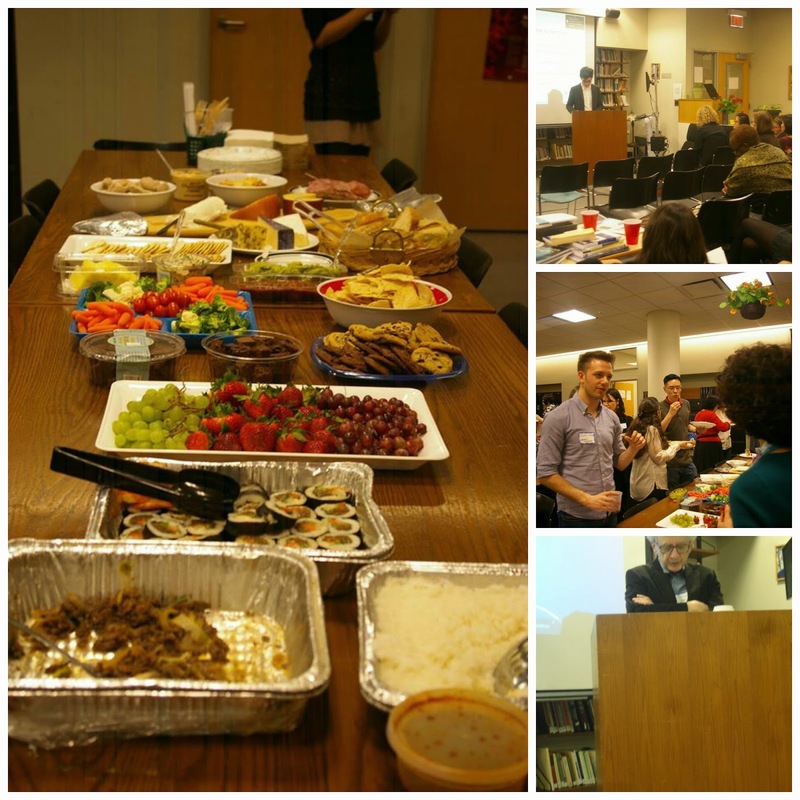 Clockwise from top left: delicious Korean spread for lunch; Professor Attewell asks a question; Jonas Wiedner looks on; Bernadette Ludwig presents her work on the Liberian community in Staten Island. Clockwise from left: Some of the reception offerings; Jonas Wiedner presents his work on immigrants and the labor market; Conference co-coordinator Zach Shultz talks of recent happenings; Professor Alba discusses papers on changes in the education of immigrants. 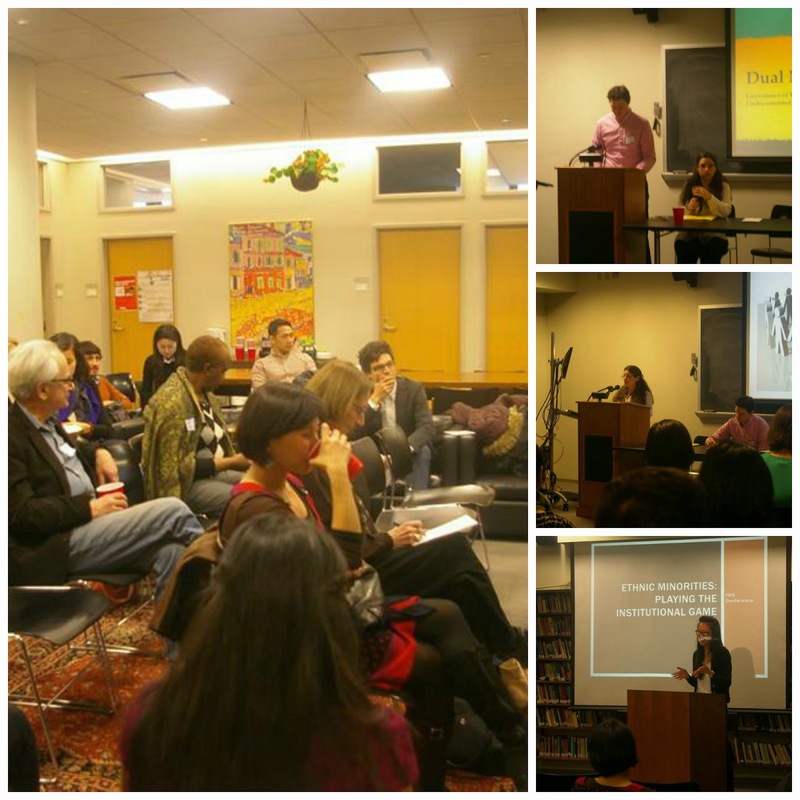 Our March 28 conference, "New Directions in Immigration," featured panels on race & ethnicity, education, law & governance, work, and identity. 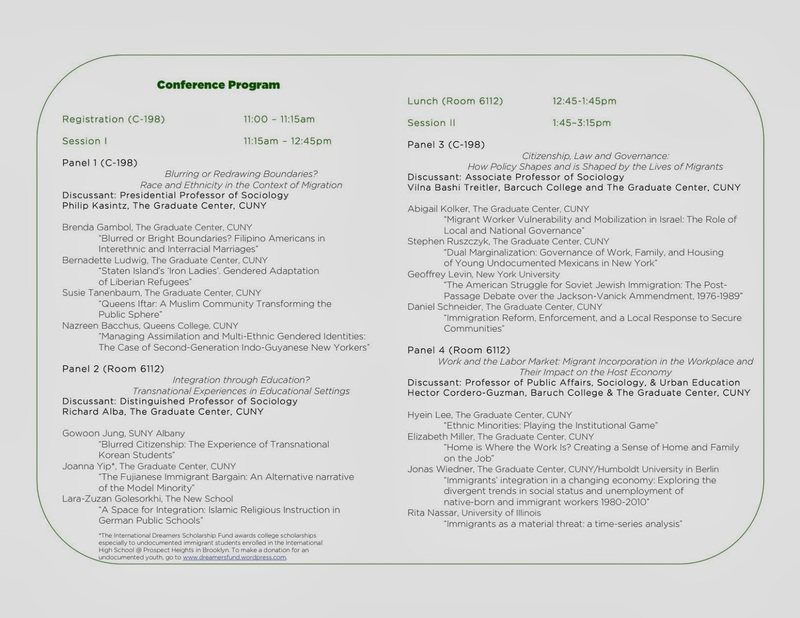 Please see the program below for more information on our panelists and discussants. 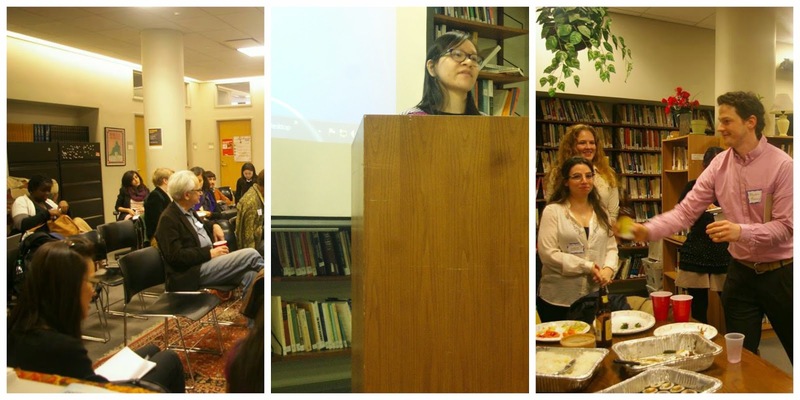 Clockwise from left: Tommy Wu, Professor Alba, Professor Foner, and Professor Chin at the start of the work panel; Stephen Ruszczyk presents his work on the governance of NYC undocumented youth; Abigail Kolker presents her research on undocumented care workers in Israel; and Hyein Lee discusses ethnic minorities. 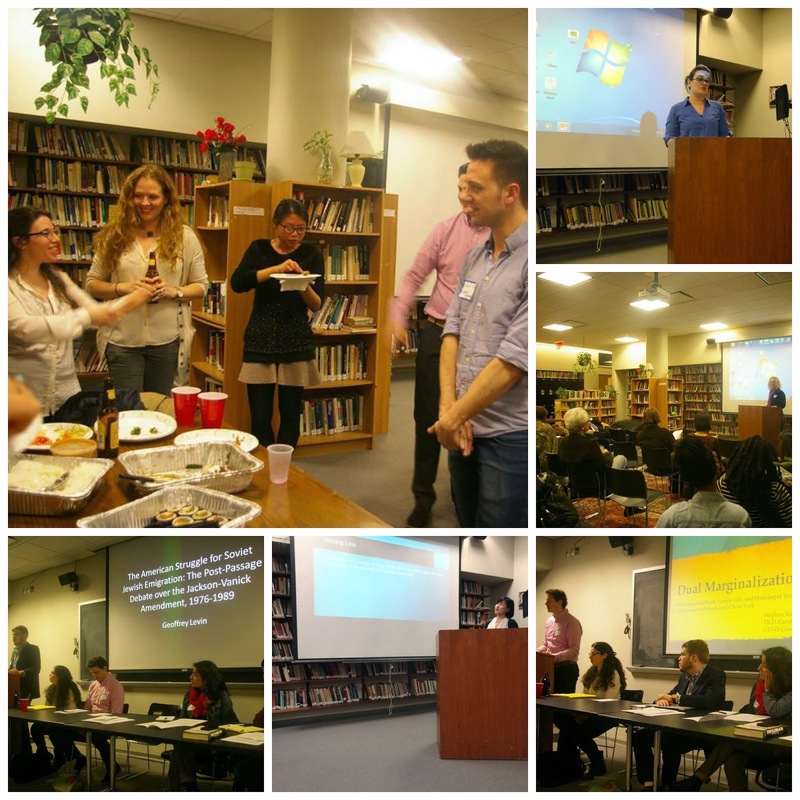 Clockwise from upper left: Conference co-coordinators Abigail Kolker (l), Elisabeth Brodbeck (second from left), and Zach Shultz (r) enjoying the reception with Siqi Tu; Lara-Zuzan Golesorkhi presents her research on Islamic religious instruction in German schools; the audience of an afternoon panel; Abigail Kolker, Geoffrey Levin, and Marlene Ramos look on as Stephen Ruszczyk presents; Gowoon Jung discusses her work on transnational Korean students; and Geoffrey Levin presents emigration from the Soviet Union. 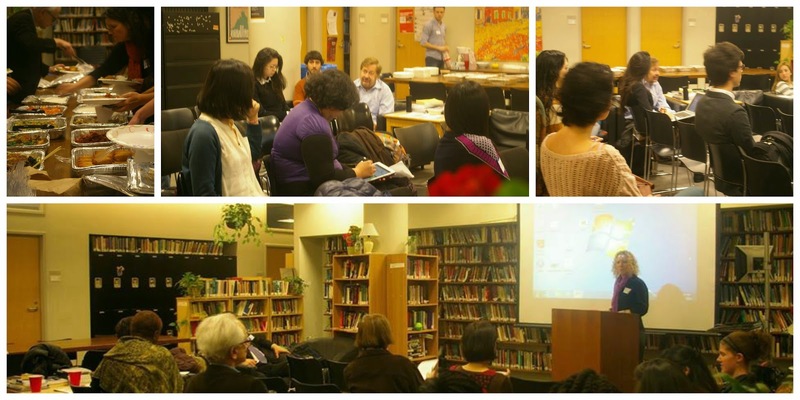 From left: The audience from an early panel; Joanna Yip presents her findings on Fujianese students in New York; the reception. Many thanks to our sponsors: the Graduate Center Sociology Students' Association, the Center for Latin America, Caribbean, and Latino Studies, the Doctoral Students' Council, the Center for Urban Research, and the Graduate Center Sociology Department! A year after a group of US Senators introduced an immigration reform bill in Congress—the largest of its kind proposed in nearly two decades—the promise of reform remains unfulfilled. Nevertheless, migrants continue to leave their home countries for the US to make meaningful contributions in their new communities, while the US immigration system proceeds to separate families through the deportation process at increasing rates. The Immigration Working Group (IWG) invites papers from across disciplines that elucidate the multifaceted nature of immigration in its upcoming conference. This conference also aims to celebrate the research of recent graduates and IWG members. Panel 2: State Responses to Immigration -exploring how governments here and abroad respond to immigrants in way that promote or hinder their social, economic and political incorporation. Panel 3: Immigrant Ingenuity in Integration: exploring how immigrants and their children have adapted to their environments by utilizing educational, cultural, and/or economic institutions to improve their lives while contributing to their communities. We welcome the submission of papers dealing with other immigration-related topics as well and encourage graduate students or recent graduates from all fields and disciplines to participate. Submissions: If you are interested in presenting a paper at the conference, please submit an abstract of no more than 500 words by February 28, 2014 to the IWG using the submission form found here. All applicants will be notified of a submission decision by March 7, 2014. For more information, please contact the Immigration Working Group at elisabeth.brodbeck@gmail.com.